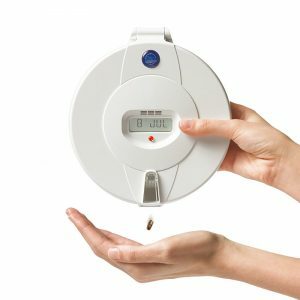 Careousel® Automatic Pill Dispensers alert the user when to take their medication by means of an alarm and flashing light. It makes the correct dose available for the user at the correct time of day or night, whilst keeping other pills locked out of sight. The dispenser tray contains 28 sections. Careousel Automatic Pill Dispensers incorporate important features designed to help the user remain compliant with their medication regime and support their family members, carers and pharmacists. They are used by elderly with confusion or dementia, people with a complicated medication regime, or learning difficulties. Careousel automatic pill dispensers can enable people to remain living independently at home for longer. A Pharmacist, Carer or relative can easily fill and program the dispenser to present pills from 1 up to 24/28 times a day. At the programmed times, the dispenser rotates, the alarm sounds, and the correct dosage comes into view through the opening in the lid. 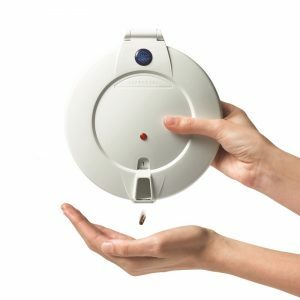 The alarm can sound for up to 5 hours, or until the dispenser is tilted so that the pills fall into the hand or suitable container. This will cancel the alarm. *Click here to see comparison chart for specification of each model. Careousel® MK3-11 Dispensers have been widely used throughout the UK since 2002, until the introduction of the Careousel Advance Dispenser in 2012. Due to its proven reliability, it was for many years the preferred choice among professional care agencies within the NHS and Local Authority Social Services. The Careousel Advance has the same basic functions as the Careousel Mk3-11 but with important security features in addition. As a result this dispenser is now the preferred choice of professional care agencies within health and social care in the UK. This is now the default dispenser used by professionals. 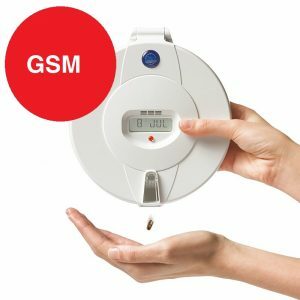 The Careousel® Advance GSM and GPRS dispensers include all of the features of the Careousel® Advance dispenser, with a communication module which will transmit messages to three pre-programmed contacts and also an e-mail, if medication has not been dispensed from the device at the alarm time. Family or Carers can therefore take appropriate action to be taken to check on the wellbeing of the individual before an adverse event occurs. GSM/GPRS models can send alert messages via API to your platform / App. Contact Pharmacell for more information. Security: The self-locking shutter over the lid opening can prevent access to the medication tray except at the time that medication is programmed to be available. This prevents the user from the possibility of double dosing or the forced movement of the medication tray. Operation: At the alarm time the tray advances clockwise and the shutter is released. The alarm sounds and the light flashes to alert the user. The medication can be accessed by tilting the dispenser through 90 degrees; the shutter will swing open allowing the medication to fall out. The user tips the medication into the hand or a suitable container. Locking: Once the user has dispensed the medication and returned the dispenser to the horizontal position the shutter will then lock, making the medication tray inaccessible. If the user does not dispense the medication within the programmed alarm time (the After time: 5min–5hrs) the shutter locks and makes the medication that remained in the open pill compartment inaccessible. This removes the possibility that the user will be able to take a dose immediately before the next dose is due and potentially double dose. 28 Compartments. Two or more compartments can be programmed to alarm at the same time (for many or large pills). Start delay function – Pharmacists can fill in advance away from the user’s home. Stop function. Deactivate the dispenser – useful for those rotating multiple dispensers in the home. Flashing light alerts those with hearing impairment. Lockable. Only the medication due can be accessed by the user. Batteries – the dispensers use either Alkaline AA or re-chargeable batteries. Battery life – up to 12 months. Battery level meter and warning indicator. Secure battery case cover deters tampering (screw provided). Spare trays, lids and time discs are available for off-site filling by family members or pharmacists. Advance and MK3/11 models Can be Telecare enabled (e.g. CI0108M1Hxx,CviLux 8 pin / Lifeline / Carephone / Sayphone systems) with Alarm Response Centre response. GSM/GPRS models can send alert messages via API to your platform / App.